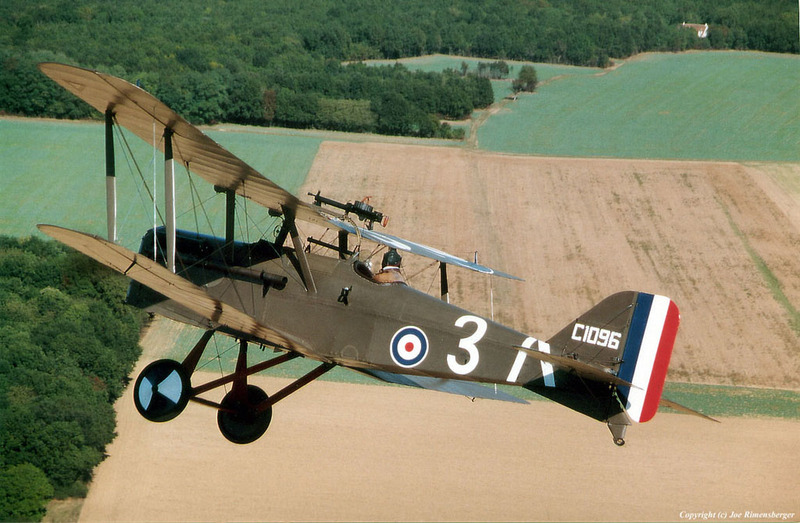 The S.E.5/5a, rivals the Sopwith Camel for the title of the most successful British fighter of the First World War. 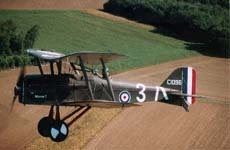 It was designed by H. P. Folland, J. Kenworthy and Major F. W. Goodden of the Royal Aircraft Factory. 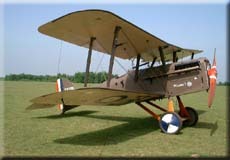 The prototype S.E.5, A4561, appeared in December 1916, powered by the new 150 h.p. Hispano-Suiza engine with a car-type radiator and short exhaust manifolds. 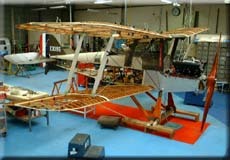 The wings had wire-braced spruce spars and, in place of compression struts, some ribs were of solid construction. The tailplane incidence could be changed in flight. 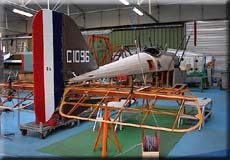 The fuselage was a wire-braced wooden box girder, covered with fabric except for plywood sides from the nose to the front spar of the lower wing, and around the cockpit. The main fuel tank was behind the engine, and there was a gravity tank in the port side of the centre section. In January 1917 the wings of the prototype collapsed in flight, and Major Goodden was killed. 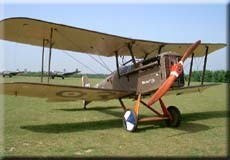 The main planes of subsequent machines were strengthened, their span was reduced and blunter tips were fitted. A few of the early production aircraft, however, retained the wing plan of the first two prototypes. A Vickers gun, fixed on the port side of the fuselage with its breech inside the cockpit, fired through the airscrew by means of the Constantinesco interrupter gear. A Lewis gun on a Foster mounting could be fired ahead over the top wing or directly upwards. The type first went to France on 7 April 1917, with No. 56 Squadron. 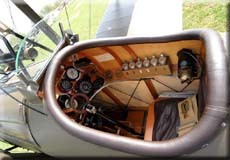 The early machines had celluloid "green-houses" over the cockpits; these were liable to be dangerous in a crash, so Major Bloomfield, the C.O., had them replaced by flat Triplex windscreens. 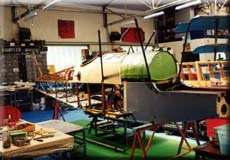 The gravity tank was soon moved from the top of the wing to a position inside the centre section. A few S.E.5s had faired head-rests. A modified version, the S.E.5a, powered by the 200 h.p. geared Hispano-Suiza engine, was introduced in June 1917. It had a rather deeper nose than that of the S.E.5, radiator shutters and long exhaust pipes. The standard faired head-rest was frequently removed to improve the rearward view. 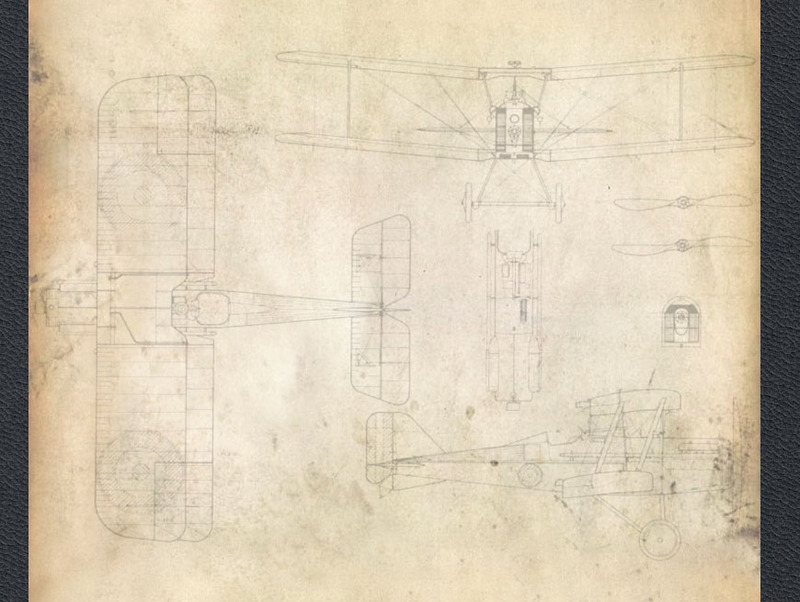 From December 1917, the front struts of the undercarriage vees were strengthened. The geared 200 h.p. engine suffered from manufacturing faults, and there were frequent failures. In addition, engine construction lagged behind airframe manufacture, and the S.E.5a was not available in quantity until well into1918. 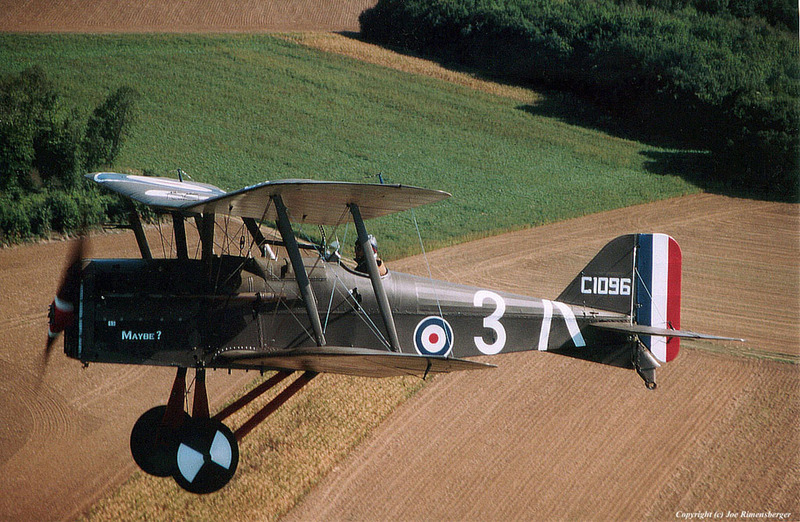 Eventually the Wolseley W.4a Viper 200 h.p. engine, based on the Hispano-Suiza, became standard and there were no more engine difficulties. The Viper's radiator was square and bulky, with short horizontal shutters. Both friend and foe recognised the S.E. 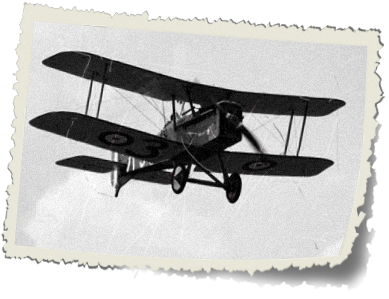 as a formidable fighting machine; it was fast, extremely strong and easy to fly. Superior to the Albatros D-III and D-V, the Pfalz D-III and the Fokker Dr-I, it was not outclassed when the excellent Fokker D-VII appeared in May 1918. It is significant that the S.E.5a was the mount of Mannock (73 victories), Bishop (72), McCudden (57) and Beauchamp-Proctor (54). Some machines, of No. 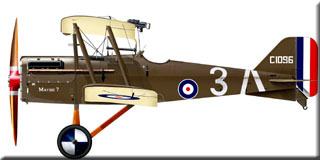 24 Squadron were rigged with reduced dihedral to improve their manoeuvrability. A total of 5 205 SE5s and 5as was constructed. 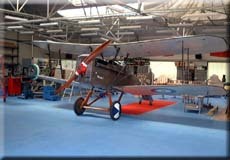 Started in the UK in the 1980s by John Tetley and "Bill" Sneesby, the machine ,built using original plans, was transfered to France to be completed and flown. 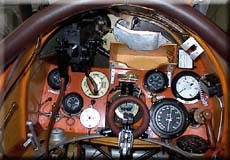 Some parts are original, such as the engine, instruments and fuel tank. It will be finished in the colours of Lt. H. J. 'Hank' Burden of 56 Squadron in April 1918. Some technic: SE5a standard starting procedure (2002). To answer the curiosity, here's the starting procedure. Like all water cooled engine, the SE is equipped with an expansion tank. It is situated in the cabane leading edge beside the emergency fuel tank. This emergency tank gives you about 20 min flying time at max RPM. The carburator is fuel fed by pressurizing the main tank with an engine driven compressor or hand pump or both. The emergency works by gravity. Put the airplane in a level attitude using a trestle. Fill up the fuel tank. Get a stepladder and climb in the cockpit. Check mags off and starting mag off. Air selector on hand pump. Air release valve on the hand pump off. Fuel selector on main to emergency. You know the emerg. is full when you see fuel comming off the overflow pipe (Trailing edge left side). Release air pressure and fill up main tank. Pressurize the main tank again. Fuel selector on main to carburator. Air selector on engine pump. Two guys on the wheels to do the injections while a third one turns the prop. Two guys holdind the tail and a third with fire extinguisher. Stick fully back (with your knees). The mecanic bounces the prop,you turn the start mag and catch the engine with the throttle. Check oil and air pressure. Run the engine four min at 800 rpm. Turn the fuel off to stop the engine. (30 sec at 600 rpm). Check for air in the coolant circuit (air pockets could dammage the water pipes or the radiator). Start the engine again ( you don't need to prime, just open the fuel and turn the prop about 12 blades ) and so on until no air bubbles in the circuit. 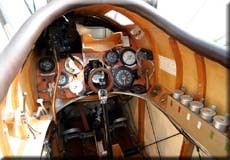 During the first 30s, Se5 engine sound is hidden by the more powerfull Spad engine but you can cleary hear on landing the characteristic whistling of the Se5.